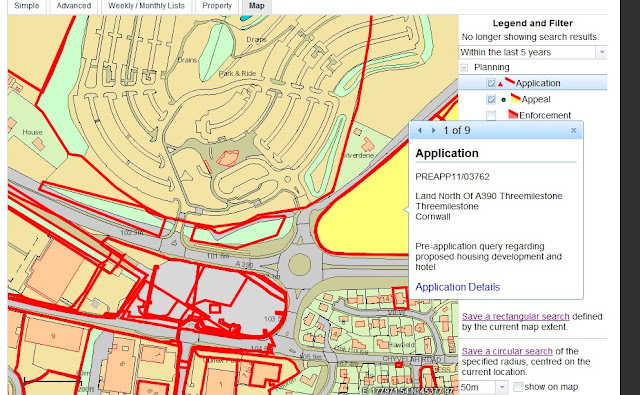 When the large applications for the west side of Truro were granted last year, the Head of Planning was given three months to negotiate the 'planning gain' (Section 106) agreements. There has been an understandable delay due to the need to refer the applications to the Secretary of State. But in all cases that process ended 3 months or more ago. Under pressure from another developer (miffed having submitted the only retail application turned down for the corridor) , officers took the applications back to the Strategic Planning Committee to get an extension of time. They blamed the Government, as Cornwall Council are wont to do. But the new rules complained off, by the Council's own admission, came in last April, so not that new. The Council also said that the Section 106 agreements were now concluded but, bizarrely, they asked for an indefinite extension of time to complete the agreements. And for future occasions they said they would draft reports for the Committee so that they could take as long as they wanted and not come back to Committee.The Committee granted them a 6 month extension. So, in summary, the Council claimed that 3 months was adequate but when it came to it, needed at least an extra 6 months. But the Chairman did not allow me to speak. I have been asked what can anyone do. I can only suggest that you get in touch with Cllr Nolan, the Chairman of the Committee or take the Council's decision to judicial review. 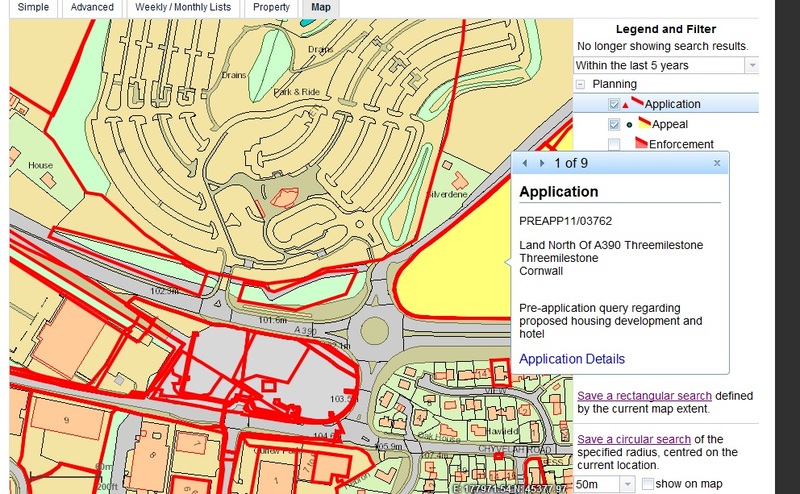 Try the Cornwall Council planning application comment link. Search for "Langarth". On the right hand side you can enlarge a map of the area until you see the areas surrounded by red (lots of it!). Filter on 5 years and zoom in to a specific area. Double click and it should bring a pop-up of all the relevant applications in the last 5 years. Is there a website that one can go to find information about the works being done? I've searched and searched but cannot find out what is being built on the Threemilestone Retail Park extension next to the roundabout.